Phoebe had her assessment this morning. She is a five month old, 20 pound (? 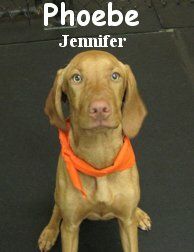 ), pleasant little Vizsla. Phoebe played fabulously in the Medium Roll, she was as lively as the best of them! We think she will get a lot out of attending doggie daycare and can't wait to see her again. P.S. Check this out: Euthanized Dog Comes Back to Life. My goodness, talk about an awkward situation!